Yellow, White, Pink Gold? You Don't Have to Decide! Posted on May 21, 2010 at 2:47 pm. 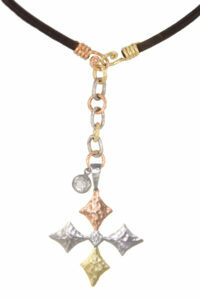 We just unpacked some of the new beauties that are coming our way from Pamela Froman this summer! While I was first drawn to the solid color gold pieces in Pamela’s collection, I have become a BIG fan of her use of multiple colors of gold in one. I believe that the look is truly unique, and I love how warm the combination of the three colors look together. 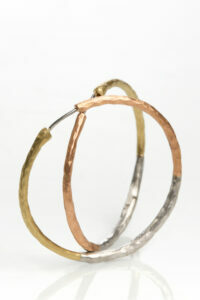 I’m thinking that I might have to add a pair of these hoops in my jewelry box — what about you? We’ll be hosting Pamela for her first trunk show in Minnesota this August 13-14, but I hope that you’ll stop by before that to this collection.